My district is doing a staggered implementation of the common core. Fourth grade will start the process of researching the standards and aligning the common core with our current curriculum resources, as well as piloting new math programs. We use a very, very, very old edition of Investigations and it covers less than 40% of the common core, so a new program is very much needed. I will begin teaching the Common Core standards next year. Anyhoos, one of the standards I need to cover with my little people this upcoming year is to read, write, represent, and compare whole numbers through the millions. The teacher I am replacing has graciously left me all her files, and they've been a great starting point for planning, but I still want to put my own creative twist on our Place Value Unit, which is our first unit of the year. 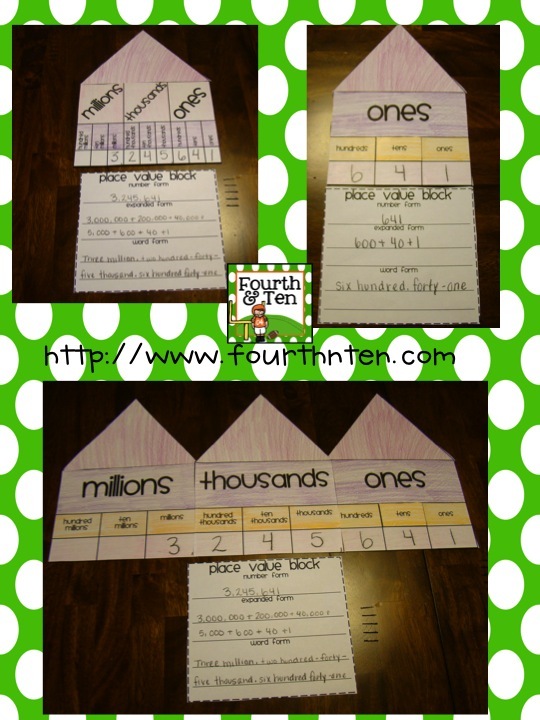 I've pinned many place value resources, and loved a representation I saw of place value as a house. I took the idea and ran with it, and came up with a little math craftivity. 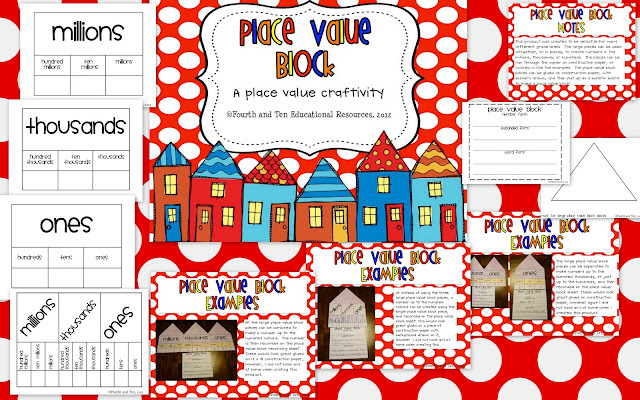 My Place Value Block Craftivity is available at my Teachers Pay Teachers and Teachers Notebook stores. I'll be giving away a FREE copy to the first two people who comment! :) Please leave your email address in your comment! Gah! So cute! Can't believe I missed this one! (Note to self: keep google reader on ALL.THE.TIME!) Totally gonna pin this. I LOVE this idea and we are doing it tomorrow. I gave you and it a shout-out on my blog! Thanks so much, Lisa. Hoping to do this with my third graders as we prepare to soon be fourth graders. I think I'm going to have them order their place value homes once we get them all made. My kiddos are still struggling with the concept of number line so I thought we could make a little human one with all of our great numbers!